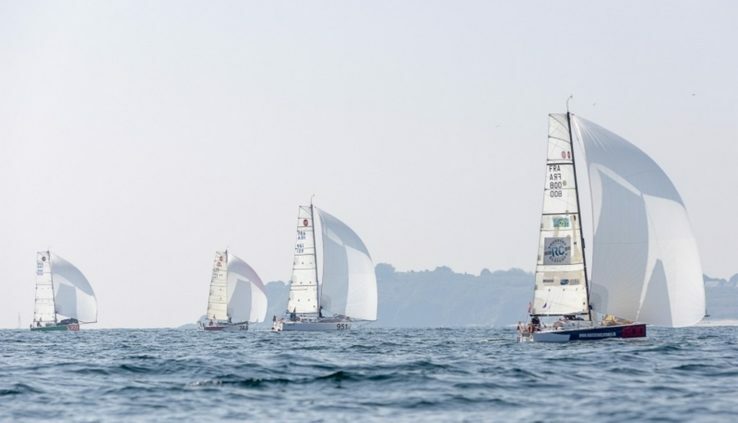 Sunday, April 14, in France, ended the 250-mile regatta Mini 6.50 Plastimo Lorient, which was attended by teams of Russian yachtsmen, Irina Gracheva and Fyodor Druzhinin. Last competitions were the first in this year’s phase of preparation of athletes for the final start of the season – a single of the transatlantic race Mini Transat 2019. In the regatta Plastimo Lorient Mini 6.5 was attended by crews consisting of two people. Irina Gracheva were paired with Saint Petersburg rider, Vasiliy Alekseev, Fedor Druzhinin assisted Belarusian yachtsman Alexander Rachevsky. Ended the race with a length of 250 miles took place in the Bay of Biscay (start and finish in the port of Lorient) and lasted about two days. Wind conditions during these two days were not smooth: rather soft, 10-knots wind at the beginning of the regatta towards the end in the gusts have already reached 25 knots. In total the competition was attended by 68 teams, six of which are for various reasons not reached the finish line. We will remind, Irina Gracheva and Fyodor Druzhinin racing class Mini speakers in different groups. Grachev for the preparation and participation in the Mini Transat chose division serial yachts, Druzhinin – division Proto. For Russian sailors, the first race of the season has developed quite successfully. Team ASSIST (F. Druzhinin, A. Rachevsky) took 5 th place in their group (only 20 members), and the team of IRINA GRACHEVA RACING (I. Grachev and V. Alekseev) was 11th in the serial division (48 players). The following official competitions, with the participation of Irina Gracheva, will be a 300-mile single race Pornichet Select 6.50, which starts April 27.